Your driveways appearance creates a perception. Driveways come in all shapes and surfaces! Wherever there are cars, driveways exist and so it is that most homes have one and from time to time cleaning that driveway becomes an exercise that most don’t want to tackle. Domestic driveway sizes generally range from 60m2 and can go upward of 1500m2 and are predominantly made of concrete in one form or another. Stencilled, stamped, plain, coloured, exposed aggregate (pebble Crete), are some of the most common cement types. Clay pavers are another commonly used product and they all have one thing in common! Yep that’s right they get dirty. Have you ever tried to high pressure clean a driveway that is say 100m2 in size and all you have is a domestic size Gerni or Karcher. It takes days to clean that much area and they never clean up that well with just water anyway, you have to use a treatment if you want it really clean and if you going to spend that much time doing it why would you waist your precious time and not make sure its spot on? 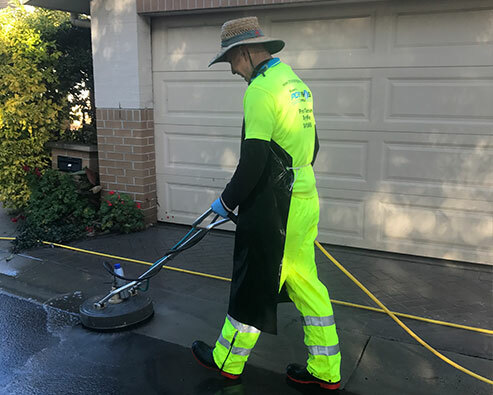 Power Wash Australia use high powered, high flow rotary cleaners in combination with a spray application of a specially formulated treatment that is designed to penetrate deep into the pours of the substrate flushing out the live contaminants such as algae. It’s the treatment that gives you that 100% clean look. If you have stamped, stencilled or coloured concrete driveways the chances are that you may need to have it sealed with our Hi Tech decorative concrete sealer after cleaning and we can help you with that. You could possibly even have some colour wear and you might need our colour addition service. If it’s plain grey concrete it probably just needs our treatment and a good high pressure clean and the same with pebble Crete. I don’t recommend sealing either plain concrete or pebble Crete. High pressure water cleaning paved driveways. Clay pavers or cement pavers suffer the same problems as concrete as they to get dirty. The one difference is that pavers have joints everywhere which allows somewhere for weeds to take root and grow. How many times have you poisoned the weeds on your paved driveway only to have them return soon after? Because of the migration of seeds in the air it is virtually impossible to eliminate the growth of weeds because over time dirt builds up between the pavers giving the seeds a place to germinate. The only way to limit the growth of weeds is to limit the amount of dirt build up through cleaning. Our cleaning process for paved driveways will completely remove all weeds and leave your pavers looking like they were just laid.